The white colors here are all produced by painting. Value is 8.5 or over and Chroma is under 1.3. Neutral colors is divided with 3 gloss levels. The white colors here are all produced by urethane-painting. PET is used as a base material for the plates, which are painted. A mask is supplemented with for easy color comparisons! 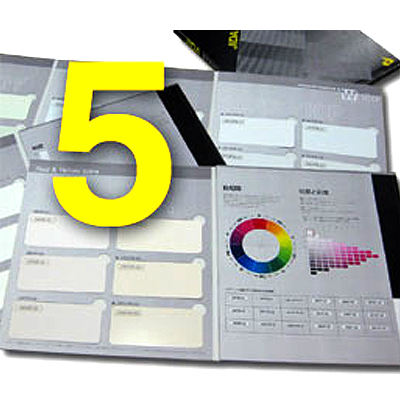 Colors of white that exist in the color gamut between R and 10Y are widely used for various purposes, so colors with 6 different hues are selected and further divided changing values into 18 white colors, which are included in this color book. Colors of white that exist in the color gamut between GY and P are used quite limitedly, so 5 white colors with usable different hues were selected and by changing their values accordingly 15 colors were obtained in all. The 15 colors are included here. A mask is supplemented with for easy color comparisons.